Home Miss Universe Miss World ARUBA's Reps for Miss Universe & Miss World named! ARUBA's Reps for Miss Universe & Miss World named! Miss Universe Aruba 2016 is Charlene Leslie! The finale of Miss Aruba 2016 was held on August 20’ 2016 at the Ballroom of Hilton Aruba. The 23-year-old six-footer stunner will compete at Miss Universe 2016 in the Philippines. The last time Aruba placed in Miss Universe was Taryn Mansell's first runner up finished in 1996. At the same event, Lynette Do Nascimento was crowned as Miss World Aruba 2016. 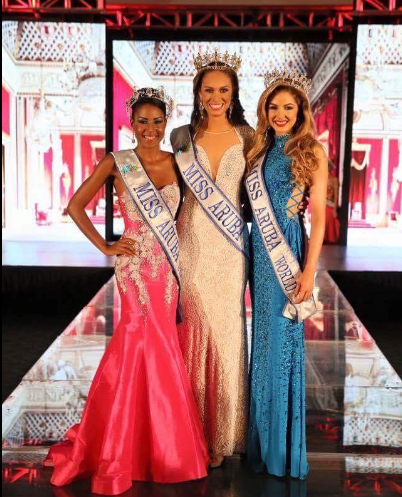 Lynette succeeds Miss World Aruba 2015 Nicole van Tellingen, and will now have the oppurtunity to represent Aruba at the Miss World 2016 pageant in Washington DC, USA. For Miss Grand International Aruba, Chimay Ramos won the title on that night also and will represent Aruba at the Miss Grand International 2016 pageant in Las Vegas, USA.